Let’s be honest: Heartburn is a relatively tame term for your chest and throat feeling like they’re literally on fire – and when you have it, you’ll do anything to get rid of it. So it’s totally understandable why you might turn to some home remedies to extinguish that fire – STAT. One that’s been making the rounds: Drinking apple cider vinegar (ACV)… really. I know what you’re thinking: ACV kind of burns to begin with, so why on earth would I want to torture myself more? But there actually might be something to this. I’m skeptical… can ACV really cure heartburn? Okay, so “cure” is a strong word. The drinking-ACV-for-heartburn advice comes from a few different websites and blogs, but most credit one college thesis paper from Arizona State University (so, it is not a peer-reviewed, published study). Still, the paper’s researcher – a graduate student – conducted a randomised, placebo-controlled, double-blind, cross-over research study that had people either eat a meal with chilli (and take nothing), take an antacid after a chilli meal, eat chilli that had apple cider vinegar added to it, or drink diluted ACV after eating the chilli. Those who had vinegar in any form seemed to do pretty well in the heartburn department (similarly to those who took antacids) but, the researcher said, more research is needed. Other than that, there’s no reputable research on this. Still, this move “works for some individuals with mild heartburn,” says Dr Ashkan Farhadi, a gastroenterologist at MemorialCare Orange Coast Medical Center and director of MemorialCare Medical Group’s Digestive Disease Project in Fountain Valley, California. So, why can ACV help mild heartburn? When you have heartburn, the acid in your stomach travels up through your oesophagus (which connects your throat and stomach) and irritates it, causing that burning, tight feeling in your chest. Here’s the thing: This doesn’t work for everyone and in some people, using ACV will make your heartburn even worse. If you’re having significant reflux and a lot of irritation, ACV going over your oesophagus can irritate it, prompting those intense heartburn symptoms. 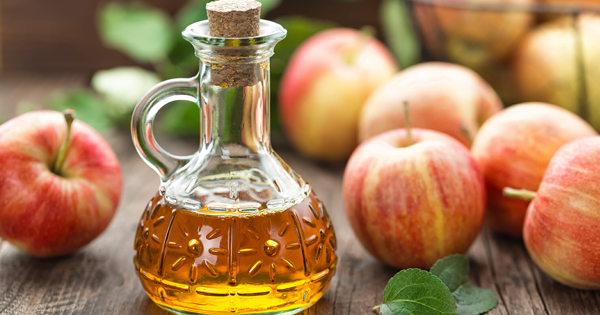 “Apple cider vinegar may be helpful in mild cases, but it definitely doesn’t [help] in moderate to severe reflux,” Dr Farhadi says. If you’ve got a serious heartburn problem going on, it’s best to try OTC heartburn medications and, if that doesn’t help, see your doctor, Dr Farhadi says. But if you tend to just have a little heartburn after going to town on wasabi peas, guzzling a huge black coffee or downing a glass of OJ, you can try adding a little ACV to your routine and see where that gets you. Dr Farhadi recommends taking it on an empty stomach (that’s your best bet for bringing your stomach pH down), and having a teaspoon or so of ACV diluted in half a cup of water. If it helps, great! If it doesn’t do jack or it feels like your heartburn is getting worse, it’s time to try some medication or see your doctor.